JSSU65 is a Government Subsidised Programme under the Study Subsidy Scheme for Designated Professions/Sectors (SSSDP). For details, please visit the website HERE. For the SSSDP arrangement on the students via BENGHTCJ1, please contact the programme leader directly. This programme was accredited by the Hong Kong Institution of Engineers (HKIE). To be a Member of the HKIE via the formal training or general experience routes, the candidates must have obtained an accredited honours degree or an acceptable equivalent in a recognised engineering or technological discipline. For details, please visit the HKIE website HERE. Starting from 2018 intake, the number of subsidised places is increased to 100 under the Study Subsidy Scheme for Designated Professions/Sectors (SSSDP) while the unique JUPAS code JSSU65 is used. This programme was formerly known as Bachelor of Science (Honours) in Testing and Certification up to intake year 2016. The programme structure and content of Bachelor of Engineering (Honours) in Testing and Certification are exactly the same as those of Bachelor of Science (Honours) in Testing and Certification. The Testing and Certification industry has been identified by the HKSAR Government for strategic development. Although Testing and Certification is a new academic discipline, the OUHK has attained solid experience in providing undergraduate and postgraduate degree trainings in this area. 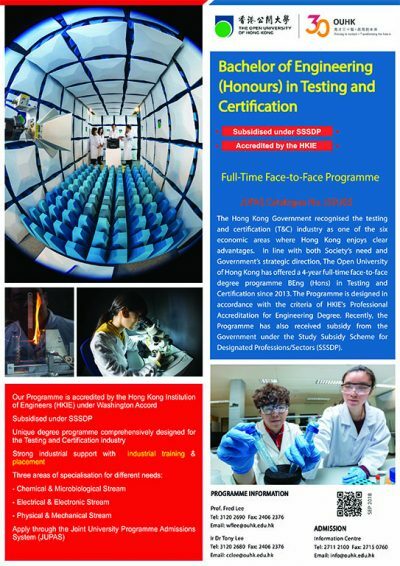 Following the establishment of the Jockey Club Campus, the OUHK is offering a 4-year full-time face-to-face BEng(Hons) in Testing and Certification (formerly known as BSc(Hons) in Testing and Certification) programme starting from 2013.
ranged from mathematics and basic sciences to metrology, instrumentation, etc. Students who do not possess HKDSE qualification are eligible to apply for admission if they have a qualification equivalent to HKDSE. They should submit the application directly to the University under the non-JUPAS route [More]. Applicants who have already applied through the JUPAS scheme 2019 are NOT eligible to apply for those programmes through non-JUPAS application. SSSDP subsidy is not applicable to non-local applicants/students of this programme.